Data is the backbone of every organization. Whatever the business, industry, or size of company, reliable access to data is essential to business continuity and survival. As the organization's data grows, it becomes still more important to have a secure backup and recovery strategy that meets the needs of the business and has the flexibility to grow and evolve with its changing priorities. 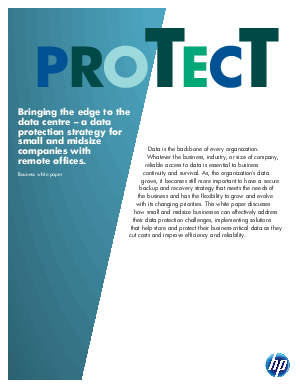 This white paper sponsored by HP + Intel discusses how small and midsize businesses can effectively address their data protection challenges, implementing solutions that help store and protect their business-critical data as they cut costs and improve efficiency and reliability.